During the warm summer months, Mammoth Lake’s switches gears from winter wonderland to climber’s paradise, with routes to satisfy everyone from beginner climbers to seasoned rock hounds. Local climbing guides offer family climbs, sport climbs, multi-pitch, and more ... all great ways to explore the Eastern Sierra mountains. Right on Main Street, we offer steals and deals on all your outdoor gear. Rock Climbing guides and courses around Mammoth Lakes and the Eastern Sierra. A first rate climbing experience starts with first rate training. Employs only the best and most experienced guides to get you started on rock climbing. SWS Mountain Guides offers guided Ascents of Mt. Whitney, with 34 years of experience. Summer is climbing season in Mammoth Lake. If you only have a few hours, head to Warming Wall located close to downtown. 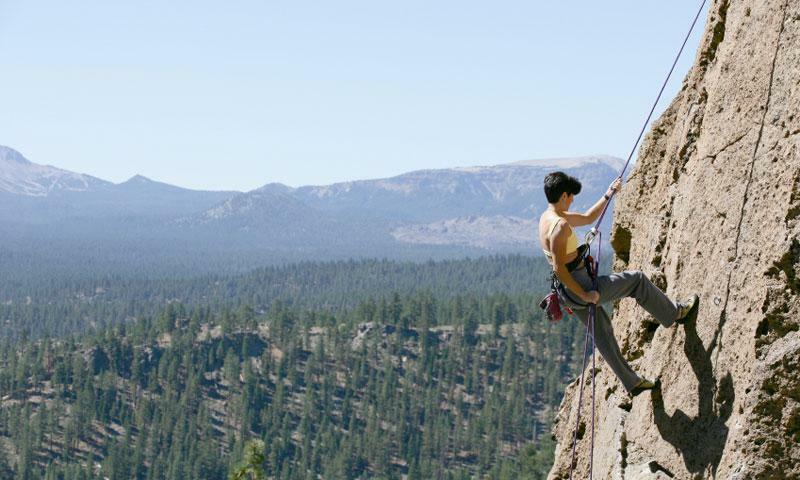 Clark Canyon boasts the best established sport climbing routes in the Mammoth Lakes area. To ensure a safe and enjoyable trip, hire one of the qualified guides listed on this page. Summertime means climbing season in Mammoth Lake. Whether you’re new to the sport or a veteran alpinist with numerous high altitude summits under your belt, you’ll find a route here. Because climbing is an inherently dangerous activity, beginners should not venture out on their own. Because of Mammoth’s high elevation and heavy winter snowfall, climbing here is primarily a summer activity. This local favorite is located in town and is great if you only have a few hours to climb. The wall is heavily textured, with lots of handholds, so it’s a good spot for beginners to learn and intermediate climbers to hone their technique. The wall is approximately 80 feet tall. This area boasts a wide variety of climbing opportunities on quality Sierra granite. Find the area by driving south on US-395 for approximately 16 miles. Exit on Rock Creek. Turn right and find the climbing on the right side of canyon. For those looking for established sport climbing routes, Clark Canyon is your best bet. The rock is highly featured with lots of handholds and conveniently placed anchors. While there are no indoor climbing gyms in Mammoth, Mammoth Mountain features a fun climbing wall as part of their Adventure Center. Right at the base of the ski area, the Climbing Rock is great for kids, families, and novice climbers. Open during the summer season only. The Eastern Sierra Climbers Coalition organizes events and activities for local climbing enthusiasts.